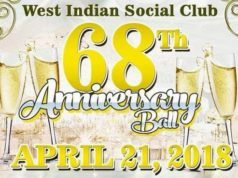 The officers and members of the West Indian Social Club of Hartford, Inc. are very excited to present our 2018 West Indian Celebration Week events. Please note that all events will be held at the West Indian Social Club located at 3340 Main Street, in Hartford, CT. The 2018 West Indian Celebration Week kicks off with Seafood Wednesday! Music by: Badda Snipes & Ranger Force. Admission $10. International Selectors Straight from Jamaica by Hotta Rice, Sparklez INTL – DJ Stardon, DJ Hot Lex, Concord Digital, DJ Kirk. Adm: $10. Red, black and white party! Hosted by DJ Trini. Admission $10. Pre-sold tickets are $15 and more at the door. The conclusion of the 2018 West Indian Celebration Week. Pre-sold tickets are $10 and $15 at the door. DIRECTIONS to 3340 Main Street, Hartford- From 91 North take exit 34 toward Windsor Ave/CT-159. Left to Meadow Road, Left to Windsor Ave (CT-159) toward Hartford. Take a left to Main Street. From 91 South take exit 34 toward North Main Street. Turn right onto Windsor Ave. (CT-159). PARKING is available on any side street in the vicinity. Please observe the even/odd parking signs on the side streets to avoid any parking citations. Park at your own risk. PARKING IS NOT ALLOWED ON TOWER AVENUE. Park at any of the affordable Hartford Parking Authority Garages and take a yellow cab, Lyft or Uber to our 3340 Main Street location. Paid parking will also be available at a number of venues on Main Street in Hartford which includes St. Monica’s Episcopal Church located at 3575 Main Street, Hartford. Please visit www.wiichartford.org for parade info, vendor applications.